This fun recipe is easy for young chefs to prepare with a little help from an adult. Heat the oven to 375 F. Trim the ends off the zucchini. At every half-inch along the zucchini, slice most of the way through the zucchini, but don’t cut all the way down. It should look like the zucchini is sliced in rounds but all the slices are still connected underneath. Gently pat the zucchini dry with a paper towel. 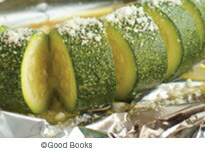 Place the zucchini on a piece of foil large enough to wrap completely around it. Drizzle the top of the zucchini with olive oil. Sprinkle with garlic and onion powders. Wrap the zucchini in foil and pinch closed. Lay it on a baking sheet. Bake for 30 to 35 minutes or until the zucchini is tender when you poke it with a fork. Remove from the oven and open the foil. Sprinkle the cheese over the zucchini. Leave the foil open. Put the zucchini back in the oven for 1 to 2 minutes, until the cheese melts and turns a little brown. Serve warm.